How Much Does a Professional Dog Trainer Cost? What About Just Buying a Pre-Trained Dog? Is It Possible To Train an Older Adult Dog? What Should You Do If Your Dog Is In Pain? "Food-guarding is a common problem that many dog owners face"
The very nature of the canine mind is to hunt and protect what they have hunted. In a pack, the dog who gets the most “wins”. They grow bigger and stronger. It makes sense that your pet may show some sort of defensive posturing when he feels his food is in danger! While it isn’t necessarily unusual, if left unchecked, food aggression can certainly lead to a serious issue. Before we go any further, let’s make sure we know what food aggression is. If a dog becomes very defensive when eating and uses threats to force others away, you can safely bet you’re dealing with a case of food aggression. Most people assume that a dog that is protective of his food is asserting dominance. This is true in some cases, but not all. Food aggression may also stem from a feeling of anxiety or fearfulness. So, now that we have identified what you’re dealing with, we can move on to what to do about it! The goal is to condition your precious pooch to look at humans approaching his bowl in a positive way. Let’s look at some practical tactics that you can begin to use to turn your dog’s food-aggression around. Stay consistent. Feeding your dog at the same time each and every day will eventually relay to him that he is going to be fed consistently. This is especially helpful for dogs who display food aggression due to anxiety. Low-traffic. 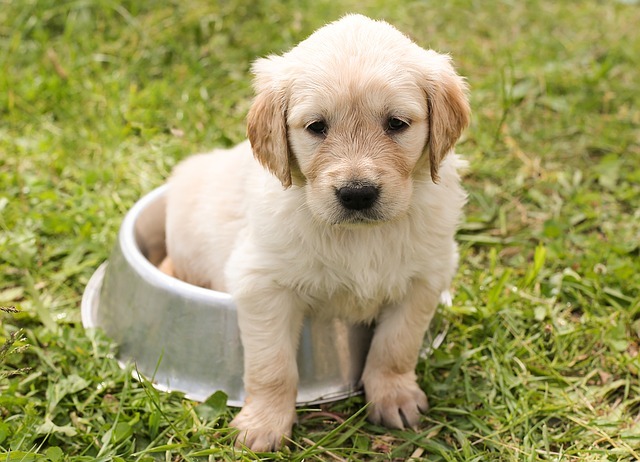 Try to keep your four-legged pal’s food dish in an area that doesn’t get too much foot traffic, if possible. The constant activity around his dish can enhance your pup’s anxiety. Teach waiting. Command your dog to sit or stay outside the room where you are preparing his food. He should continue to wait in his sit or stay position while you set his bowl down. After you have set the bowl down, stand close to it and allow the dog to come to his bowl. Remain standing near the bowl until your dog starts eating, and then you may move away. Feed your dog after the humans have eaten. Your dog should never be fed at the same time you are eating, or before you eat. Remember, dogs are pack animals and when each member eats is important in establishing the hierarchy. Feed your dog after you have eaten to reinforce that you are the leader of his pack. Hand feed. This one is just what it sounds like! Have your dog eat from your hand. As he eats, give him positive affirmations. This works for a couple reasons. One is that your dog will get used to eating with your hand near his face. The other reason is that he will associate food with affection and give human involvement a positive connotation. Treats. You want your dog to associate someone approaching his bowl in a positive light. Every once in awhile, while your dog is eating, drop one of his favorite treats in his dish. If your dog seems stressed or refuses food at any point in these interventions, seek the help of a professional. This also goes for any time in the process that your dog stops making progress. It is also important that you never yell, hit, or physically restrain your pet when they display aggression-it will only make things worse! If your dog is showing defensiveness around food, don’t allow children to participate in or be in the vicinity of the dog as you work through these training measures. With some patience and consistency, you can turn your dog’s defensive behavior around. A dog who is allowed to guard his food can eventually turn into a dog who is aggressive about anything he sees as “his”! This can extend beyond food and toys to even guarding his people. Your dog can be your best friend-you want him to be as happy, healthy, and secure as he can be! He’d do the same for you! Want to learn more about Food Aggression in dogs or hundreds of other dog training tips? Click The Button Below For Immediate Access To The Fastest, Most Comprehensive Dog Training System on the Planet!